Eggs and toast make for a classic breakfast, which is why we partnered with Great Nations Eat for this post. I love a quick egg and a slice of toast for breakfast. It's soft, comforting, and just enough to start the day. Combine the two into a quick baked bite and it's a grab-and-go breakfast you're going to love. Using a muffin tin lets you make several servings at once, saving you time on busy mornings. Place the eggs, milk, salt, and pepper in a bowl, and whisk for a few seconds until light and airy. Lightly grease the muffin tin and set aside. 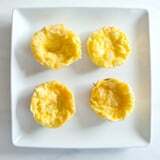 Use a juice glass to cut out 6 rounds from the three slices of bread and place them at the bottom of muffin cups. Sprinkle the tops of the toast with cheese, then evenly distribute the eggs. Bake for 12 to 15 minutes, or until eggs are set. Carefully remove from the muffin tin, and enjoy!